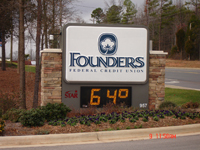 Founders Federal Credit Union hired Rapid Signs LLC to oversee exterior signage installation at approximately 25 locations in North and South Carolina. Rapid Signs has had a relationship with the credit union Founders Federal for more than two decades. They installed the credit union’s first sign in Lancaster, SC and have had a long term relationship with the union ever since. We can be your long term partner for overseeing exterior branding and exterior signage needs. At Rapid signs, we have more than seventy years of industry experience so we know the latest technologies and construction methods and can find a solution that is right for you.